OTJ Architects, fresh off its own office relocation near Metro Center in Washington, DC, recently earned a 2016 International Interior Design Association (IIDA) Honor Award. The poker table set up here allows for a small meeting to take place – or a game of poker. OTJ Architects attended the IIDA Mid-Atlantic Chapter (MAC) Design Awards and was presented with an Honor Award (Gold status) for the design of the American Gaming Association (AGA) office in Washington, DC. AGA was submitted in the “Under 10,000 Square Feet” category, and the Honor Award signifies the best project in the category. This marks the seventh IIDA MAC Award won by OTJ since 2011. 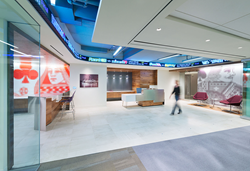 In relocating, AGA’s main goal was to modernize its space with a clean look and added flair to create a vibrant workplace that provided a leading-edge view of the gaming industry. The design incorporated gaming industry elements as if living within a game in a tasteful manner including a ticker – complete with betting lines, odds and scores that are constantly updated – that runs throughout the office. Another important objective for AGA’s office was having the ability to host events and provide a fun atmosphere for its members and staff. The main conference room opens up completely to reception so AGA can entertain within a larger space. OTJ Architects is a well-respected national interior architecture design firm that has successfully completed thousands of projects throughout the country. Founded in 1990, OTJ is comprised of five studios headquartered in Washington, DC, with more than 60 architects and designers, many of whom are LEED Accredited Professionals. OTJ works on projects coast to coast and is able to consult in all 50 states. The responsive interior architecture consultants create effective environments through listening, understanding and tailored design. These designs focus on helping clients enhance collaboration, company branding and employee recruitment and retention. OTJ’s design teams provide clients with personalized attention to create workplace solutions that reflect their unique, individual needs. For more information, please visit http://www.otj.com.